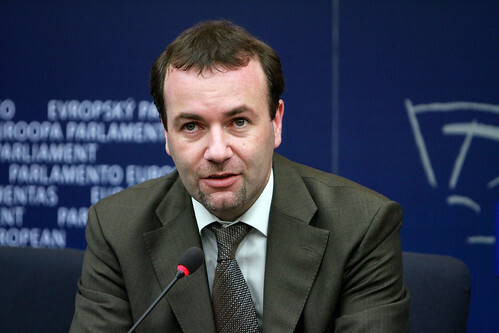 Manfred Weber is a German politician and a Member of the European Parliament. Since 2009 he is the Vice-Chairman of the Group of the European People’s Party (EPP). 'Schengen' constitutes one of the main pillars of the European Union. As one of the Union's greatest achievements, the Schengen area offers proper European added value to the people. In 1985, the contract set up freedom of movement within Europe in a mode which has never been known before. Schengen is a symbol of freedom of movement – and more, it is a symbol of the European integration and for Europe as a whole. So, the EPP Group in the European Parliament will fight for this symbol. However, during the past months, unilateral national approaches of several Member States motivated by domestic considerations accumulated, causing restraints regarding this achievement. In our view this is unacceptable. Last year, an issue on refugee policy with Italy provoked France to install controls at the Italian border, for instance. It was this experience that led the two states to request a revision of the Schengen rules with regard to enhanced assistance for states faced with massive immigration. Consequently, the European Parliament also called on the Commission to present proposals for a reform of the Schengen area. Yet, the intention of the parliamentarians was a different one: The principal aim should be to explicitly maintain free movement within the Schengen area. Since the Commission presented its proposals in September 2011, the Council and the Parliament have been seeking a compromise. The key issue is the division of responsibilities between Member States and the Commission when it comes to securing internal borders. Commissioner Cecilia Malmström’s proposal to assign the ultimate responsibility in issues of internal border controls mainly to the Commission headed for confrontation with the Council. The Council members promptly announced resistance. That is why, at the moment, the implementation of the proposal seems to be a distant prospect. Now, the European Parliament as well formally interfered in the debate. The draft report clearly shows the parliamentary endeavour to come to an agreement. Currently the first issue is to discuss the proposal within and among the different parliamentary groups and eventually to adopt a common position. After all, the basic concern of the Member States certainly is to maintain national independence in decision-making when it comes to their national borders. Berlin's and Paris' key argument is that Member States usually would be best suited to assess their own situation as regards security policy. The Commission is no security authority and therefore it would have a lack of competence, resources and necessary structures to assess and react to such situations. Furthermore, Member States would take responsible account of the exceptional measure of reintroduction of checks at internal borders whilst keeping other Member States, Commission and Parliament informed. The existing procedure, therefore, had proven its usefulness. The parliamentarians thought far more positive about the Commission's proposals. Basically all parliamentary groups welcomed the European approach proposed by the Commission. But the Member States must at least remain a key player when it comes to decisions concerning their own borders and it is also important that the European Parliament obtains a strong role. In the EPP's opinion, the crucial point is that a temporary introduction of controls at internal borders always has to be the result of a comprehensive evaluation process. There must be no space for impulsive national decisions since they would undermine Schengen rules and hence go directly against the freedom of movement. It would pose major risk if Member States were able to arbitrarily and unilaterally restrict the right to travel freely. A coherent realisation of European standards brings more benefit for European citizens than a patchwork of different carelessly chosen approaches of Member States. Thus, for us it is vital that Member States whose last resort to secure their borders seems to be a temporary reintroduction of border controls need to be accountable to the EU institutions and other Member States. The limitation of freedom of travel in a single Member State automatically has effects on its European neighbours and finally influences the whole territory of the Union. Decisions therefore must not be unilateral, but have to take into account the entirety of all Member States and European institutions. The form of participation is a matter which has to be clarified. Of course, it has to be possible that necessary decisions can be taken quickly. Nevertheless, they must not avoid prior consultations and following evaluation. Finally, one thing must be made very clear: The EPP is of the opinion that Migration flows cannot be considered a sufficient reason for the introduction of internal border controls. Immigrants must not be seen as a threat and immigration and terrorism must not be put on the same level. However, a mechanism has to be developed for cases where Member States are facing massive pressure at their external borders. At this, the most important aspect is a rigorous evaluation process in order to identify the deficiency. Only as a measure of last resort and in case these deficiencies constitute a serious threat to public policy within the Schengen area, border controls at internal borders might be reintroduced for a certain period. Clearly, the Commission proposal is going quite far. But it still leaves sufficient scope for the Member States and therefore is a good basis for the on-going discussions. A certain degree of self-regulation definitely has to be conceded to the Member States which rightly are best able to asses a situation on site. Member States must be able to continue their tasks for public safety and public order. However, in previous cases of such unilateral national actions there were not always questions of security issues involved but mainly questions of internal political hassles and tactics, for example being put under pressure of right-wing populists. Therefore, from my point of view, it is absolutely crucial that the Commission plays a strong role in the revision of the Schengen rules in order to coordinate the procedure at European level. That is the only way to maintain a strong European solidarity and to act responsibly with regard to the freedom of movement. During the on-going negotiations, the EPP Group seeks to ensure that the European Parliament acts as a mediator supporting the search for a common solution which is able to preserve both the freedom of travel in the EU and the security of every single Member State.